During the entire process concrete formwork is subjected to various loads and forces. Vertical forces are associated with the dead load from placed concrete mix, formwork and the live load of workers and their equipment. Horizontal forces result from wind and concrete dumping and should be opposed by properly designed supports. There’s also lateral pressure, which is a result of accumulated depth of placed concrete, which shall be the focus of this article. Vertical formwork, such as that for walls or columns, is subjected to internal lateral pressure from the accumulated depth of concrete placed. In a placement, fresh concrete, at least near the top and sometimes at greater depths, behaves like a liquid during vibration and generates lateral pressures equal to the vertical liquid head. Despite being a granular material with internal friction, the fluidisation of the concrete resulting from the internal vibration temporarily creates a liquid state. Nevertheless, many factors appear to contribute to lateral pressures being less than a liquid head at depths below the controlled depth of vibration. If the vertical placement rate (rate of rise) is slow, the concrete mass below may have time to begin to stiffen. What’s more, if the concrete is warm, this stiffening may begin earlier. 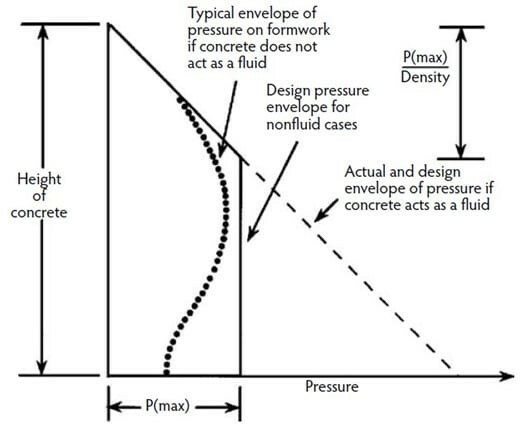 Internal concrete granular friction, formwork friction and migration of pore water are the factors that reduce the resulting lateral pressures. Admixtures like retardants, different kinds of cements, cement substitutes as well as construction practices also affect the level of lateral pressure. Tests have indicated that the pressures often have a distribution as detailed in Figure 1. above – starting as a liquid pressure near the top and reaching a maximum further down. For simplicity, design practice usually assumes that the maximum pressure is uniform at a conservative value – Pmax. Once a stable particle structure has been created, further increments of vertical load have an insignificant effect on the lateral pressure. Therefore, the maximum lateral pressure is generally below the fluid head, and it is controlled by this change of structure. 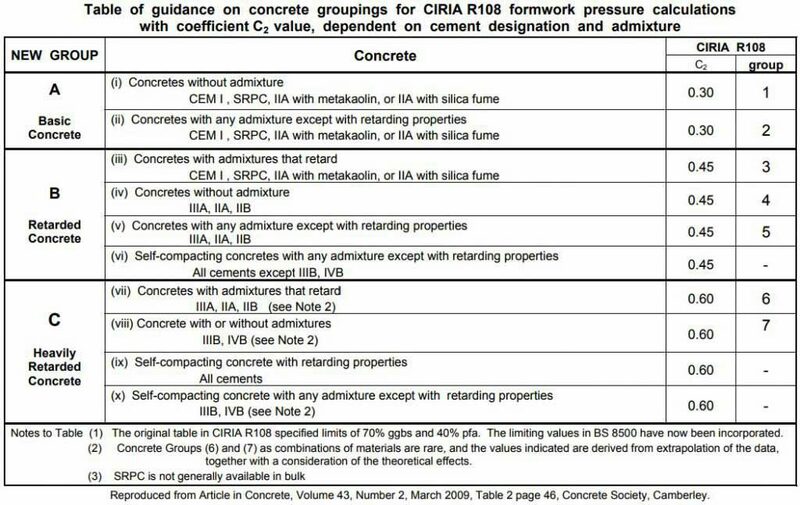 In Figure 2. below, it can be seen how concrete from different groups changes the value of lateral pressure on formwork. 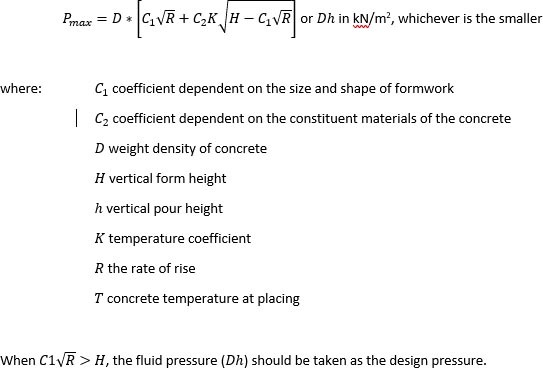 The correlation is straightforward – the more retarded the concrete is, the higher the C2 coefficient, resulting in higher pressure values.